Successfully Added Wireless Slide-Out Bluetooth Keyboard With Detachable Case - For Samsung Galaxy S4 (White) to your Shopping Cart. Wireless Slide-Out Bluetooth Keyboard with a Detachable Case has been specifically designed for the Samsung Galaxy S4 phone. Give your Samsung Galaxy S4 the extra practically it needs with this Bluetooth keyboard with a detachable case. Easily pair to your phone using Bluetooth version 3 for a more solid and stable connection, this Bluetooth keyboard is an ideal accessory for entering data or writing e-mails or text messages. There is a detachable case designed perfectly to fit your Samsung Galaxy S4 phone, however this case can be combined with the keyboard by simply slipping it into the latches. 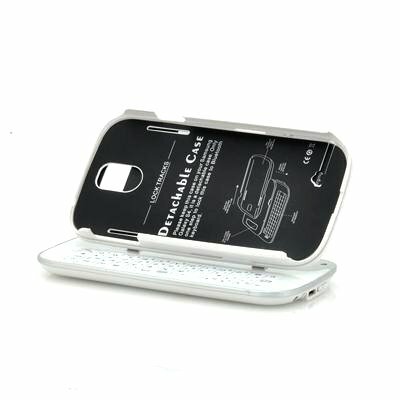 Once connected the case and keyboard combination can be altered to give a mini laptop feel to your phone. 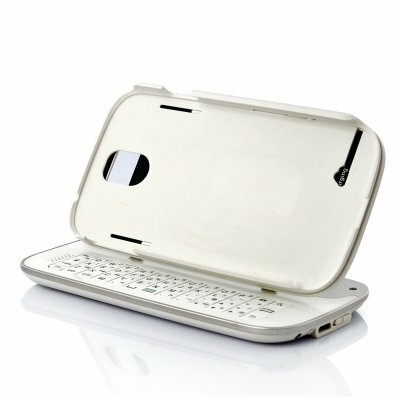 With a 0 to 90 degree tilt this keyboard and detachable case combination can be adjusted to suit your own personal viewing angle. A compact and lightweight solution for enhancing your experience when using your Samsung Galaxy S4, this keyboard will last up to 8 hours before needing it’s built-in battery recharging. Any person that uses their phone for more than playing Angry Birds and WhatsUp will find this Bluetooth Keyboard with a detachable case useful, especially when travelling around and they need to send a long email and they are not fans of using the keys on the touch screen. A wireless Bluetooth Keyboard with a detachable case that can be slid out is an ideal accessory for your Samsung Galaxy S4. This product is in stock and can be dispatched within 24 hours of ordering with a 12 month warranty. Brought to you by the leaders in wholesale electronics and phone accessories, Chinavasion.